‘Men and girls came and went like moths among the whisperings and the champagne and the stars.’ F.S, Fitzgerald. See more. A super chap, who really has taken to this Bohemian life. See more. A voluptuous, sturdy gal who enjoys dancing the night young. See more. ‘Save me the Waltz’, notably beautiful Zelda fits right into high society here. See more. When camping began to really take off in the Jazz age as cars became more accessible; peeps simply would not do without a soft bed to sleep on and a footstool to raise their spats from the floor. A little drinky-poo goes without saying and truly scrumptious food parcels were a must. Not dissimilar to how we’ve 'glam'ed up camping today. Our Yurts are named from the roaring 20s and styled to suit. ‘Tanaduke’, ‘Hildegarde’, ‘Zelda’ and ‘Gatsby’ are awfully liberated; but know how to be so; politely and with a touch of class. Our yurts are set in the stunning 6 acres of countryside surrounding our farmhouse. There are far-reaching views down the valley and up towards May hill. Each Yurt has a luxury bed, cosy, squishy duvets and pillows to sink into. They all have different set ups for families too sleeping 3–5 guests. 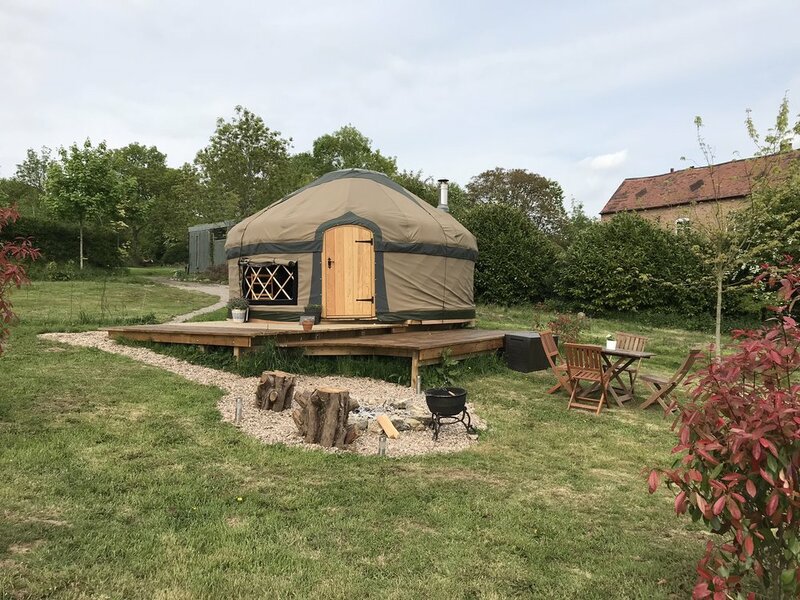 They have a woodburner that will be lit for you before arrival, if in the chillier months and allows for an open crown for when the sun is shining. The south-west facing site means it is basked in sunshine in the summer months and always has a view of glorious sunsets across the valley if nature decides to offer one up. The woodburner will heat a large kettle from which you can fill the vintage washstands of an evening. The hotplates mean you can warm one of Mrs Mills' delicious stews and tear off chunks of sourdough bread into it as the sun goes down. A menu can be found in your Yurt along with a nip of sherry to work up an appetite. 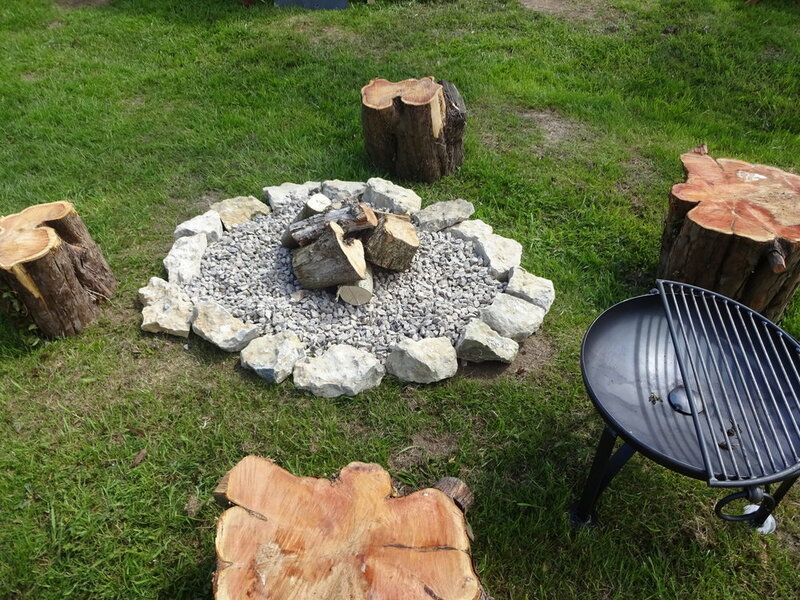 Each yurt has their own fire pit, a barbeque and a gas camping stove to cover all possible ways to cook. There is also a 'secret' kitchen with indoor dining if you are in a group and al fresco isn't possible! Inside each yurt has a kitchenette with everything you need to self-cater. It has complimentary tea and locally roasted coffee along with the essentials (salt, pepper, sugar, olive oil, tomato ketchup (bacon butties!) and your own herb garden. There is a fridge in the communal area a short walk away. All power within the yurts is solar, and terribly good it is too these days. It means you can still feel like you're camping and there'll be nothing to interrupt the dawn chorus. If you can't bare to be with out your iPad then there is a secure charge point and WiFi in the snug. Within the farmhouse, less than 150m away are private 'beach hut' bathrooms with towelling robes and complimentary Asquith and Somerset toiletries. Please note these are on the first floor up a flight of stairs. There is a new communal toilet right next to Tanaduke and Gatsby so if you are worried about the night walk to the loo pick one of these two. There is also a comfy communal snug with sofas, an old rocking chair and all the local information needed to plan your break. 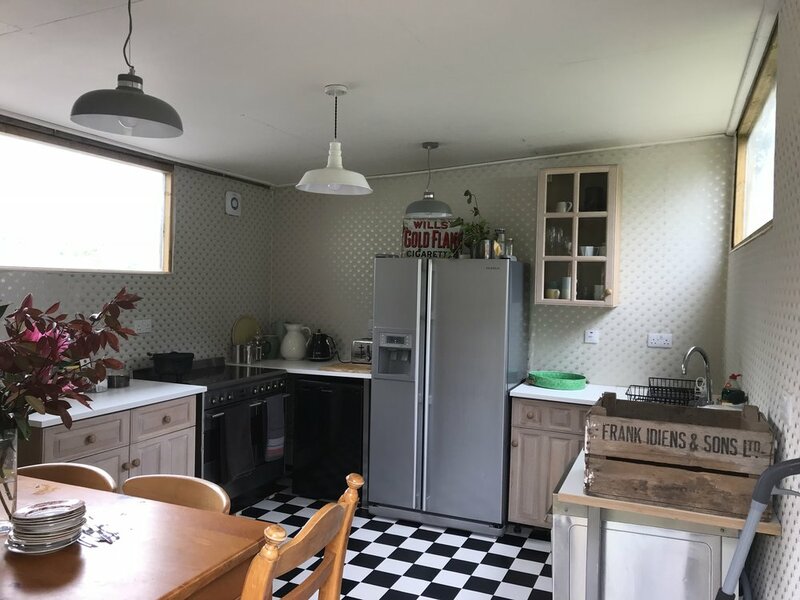 Mrs Mills serves tea and buns at the kitchen table daily and it is also where you can collect your picnic hampers or dinners should you wish to order them. The communal indoor kitchen is a secret gem behind Tanaduke. There is a double oven, large American fridge freezer with ice on tap for gin and tonic. There are also ice creams to buy here too. This is also where guests can wash up. Either by using the super speedy commercial dishwasher (the kettle won't even boil before its finished!) or in the sink. Here Mrs Mills' serves her daily treats to collect – along with a vast range of proper tea and freshly ground coffee. As we have children and have been glamping with them both at various ages; we can provide fire guards, travel cots, high chairs, a baby bath, toys and you can have full use of the playground. And an extra large gin when they've gone to bed. Just let us know beforehand and we can set up everything you need.